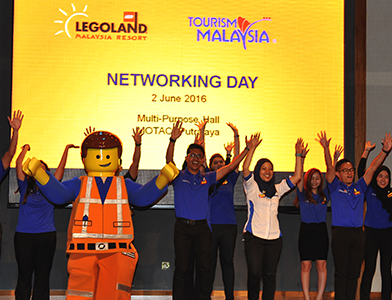 On the 2nd of June 2016, Tourism Malaysia joined forces with LEGOLAND Malaysia Resorts for the latest Tourism Malaysia Networking Day. The event was held at the Multipurpose Hall of the Ministry of Tourism and Culture, Putrajaya and launched by YBhg Datuk Seri Mirza Mohammad Taiyab, Director General of Tourism Malaysia. Its main attraction was the introduction of Legoland’s newest addition: LEGO NINJAGO™: The Ride, due to be launched in November later this year. NINJAGO™ The Ride is based on the series of the name, in which four young ninja heroes train under Master Wu. Riders will get to enjoy a similar ninja experience as the ride involves using hand gestures to hurl colour-coded projectiles at enemies that appear from the screen. Points are given for the training and battle efforts and the score will be shown at the end of the quest. It is designed to appeal to both parents and children. 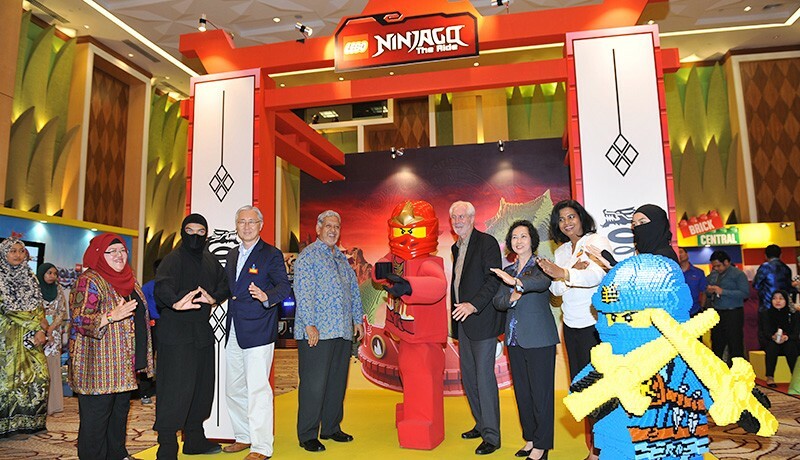 Mr Mark Germyn, General Manager of LEGOLAND Malaysia Resort explained that NINJAGO™ is the first ride in Malaysia to feature Maestro™ hand gesture technology that allows guests to enjoy an interactive adventure using only their hand gestures, without any use of hand-held devices. LEGOLAND Parks is the currently the pioneer to leverage this cutting-edge technology manufactured by Triotech; and LEGOLAND Malaysia Resort is the third in the world to use this technology, after the LEGOLAND resorts in Bilund Park and California. Other than the introduction of the NINJAGO™ Ride, there was also a Power Dance performance by LEGOLAND Malaysia Resort’s Model Citizens and screenings of the promotional videos for Malaysia Truly Asia and the Dekat Je campaign. The hall had also been decorated to resemble a mini LEGOLAND Theme Park. In attendance were 285 participants from Tourism Malaysia, MOTAC and ITC. During the event, sales for the day totalled up to 162 day tickets, 4 annual passes and 24 room nights. At 3pm, the event was wrapped up after 3 lucky draws.